In the wake of Akaflieg Douglas Flat XII in March of this year, there hasn't been many big things going on, but there sure have been a lot of little things. Brad has been racing along fitting the flaperons and airbrakes to his wings, and I've been racing along trying to keep up with Brad and deliver the little parts he needs to keep going. Things like airbrake paddles and drive hardware, flaperon control horns, and parts for the control autoconnect system that drives both the airbrakes and flaperons. I've also been trying to get ahead of Brad with regards to the fuselage drive system that controls the airbrakes and flaperons. That includes the pilot controls, the push-pull tubes back to the mid-fuselage, and the drive and mixer system that actuates the autoconnect funnels. On the basis of my ergonomics training and experience, I'm developing a single control cluster that incorporates both the airbrake and flap levers, and has no secondary locking features. For the flap lever, this means that you just grab the lever and move it until it clicks into one of five detents. It's been a bit tricky, since there is a lot going on in the mid-fuselage, mechanically speaking. It's an intensely 3D problem, with all sorts of things flailing through space. I'm attacking the design problem with a combination of 2D side-, top-, and rear-views, and also wooden mockups of proposed arrangements. Here's a semi-random selection of photos from recent activities at the Arnold shop. You can also track the project on Facebook. A couple of days after ADF 12, I cracked the remaining wing out of the mold. I spent about a day each cleaning up the airbrake slots and fitting the microstop adjusters to the outboard arms. Long about 27 March, the heater core in my Dodge Neon went from leaking a tiny bit to spewing great gobs of coolant into the HVAC box, so I changed the core. That was an all-day, pillar-to-pillar job requiring the R&R of the dashboard, steering wheel, HVAC box, and several wiring harnesses. The whole story is here. Doug came up to the shop for several weekends. Here he is test-driving one of the proposed flap and airbrake lever arrangements. Another proposed arrangement. The exact lever and knob shapes are TBD. Doug cleaning up some small parts on the grinder. 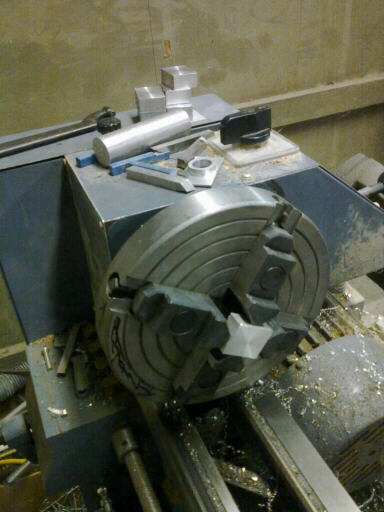 When you don't have a milling machine to face off parts, you can use a four-jaw lathe chuck in a pinch. Here I'm facing the little blocks that mount the ball bearings to the wing control autoconnect arms. Here's my see'n'saw rig for cutting the leaves that form the autoconnect arms. At the top is the master template that Doug made for me. In the middle is the pair of router templates I made from the master template, sandwiching a set of rough-cut leaves. At the bottom are the finished leaves, ready for edge cleanup with a file and a bit of sandpaper. Here's a full set of parts for the autoconnect arms, and one of the autoconnect funnels. 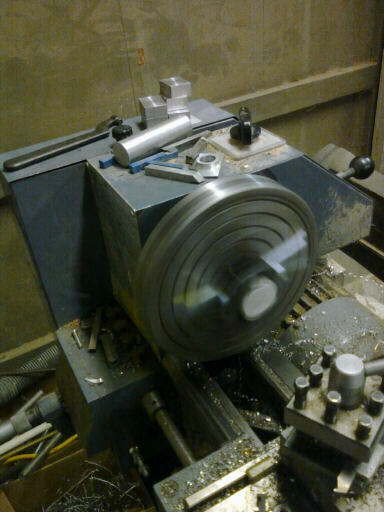 Here I'm cutting a mixing cam mockup using the router and an offset axis. I also sent out another HP-18 center stick retrofit kit. Here is the modified 18-441-1. A mockup of the mid-fuselage flap/aileron mixer and airbrake drive. A pair of the finished autoconnect arms and brackets I sent to Brad. Meanwhile, here's some photos of what Brad has going on. Brad also posts photos to the HP-24 Project Facebook page. Brad's cockpit and instrument panel. Horizontal tail mounted in place. I still need to send Brad parts for the forward mount. The wings in Brad's paint booth. These were taken when Doug was there to deliver the wings and spend a few days working on them. Brad's rudder, mounted in place. Brad has also developed this removal system for his default wingtips so he can mount his winglets and possibly a set of 16.5m extension tips. The flaperon and airbrake autoconnect arms and brackets, mounted in place. The flaperon drive horns positioned and drilled for mounting.